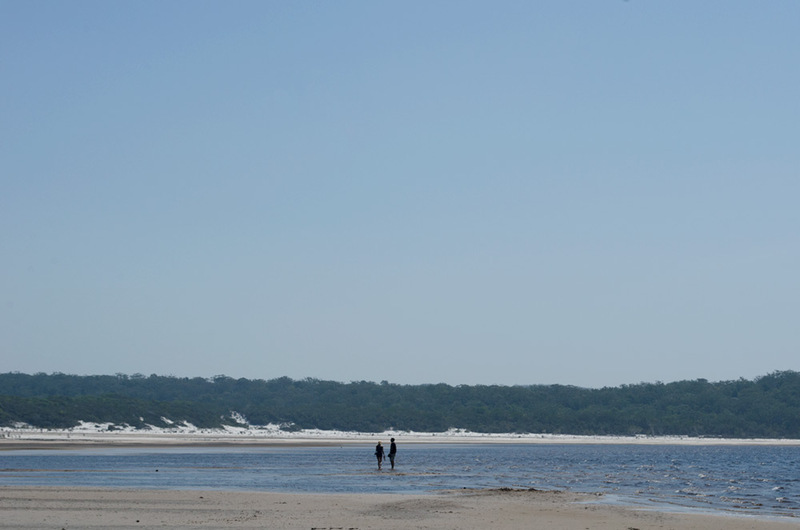 The next part of my East Coast adventure would take me to Fraser Island. It’s the world’s largest sand island stretching a preposterous 120km along South Queensland’s coast. At its widest point the colossal island reaches 22km and naturally, being a sand island, is surrounded by golden beaches. The natural wonder is the product of hundreds of thousands of years worth of sand moved by wind and tidal currents from Queensland’s eastern river systems which has been deposited onto the continental shelf off the coast. While the currents and wind coming inland helped create the island’s zig zagging outline. Its interior hosts over 100 freshwater lakes, comprising of window, barrage and perched types. Around 40% of Fraser’s lakes are perched and therefore oligotrophic, meaning there is very little nutrients present to support fauna or flora. This goes some way to explain why many of these lakes are so pure with mesmerisingly transparent water. These high dune lakes were my first real taste of the lush tropical paradises the East Coast had to offer. 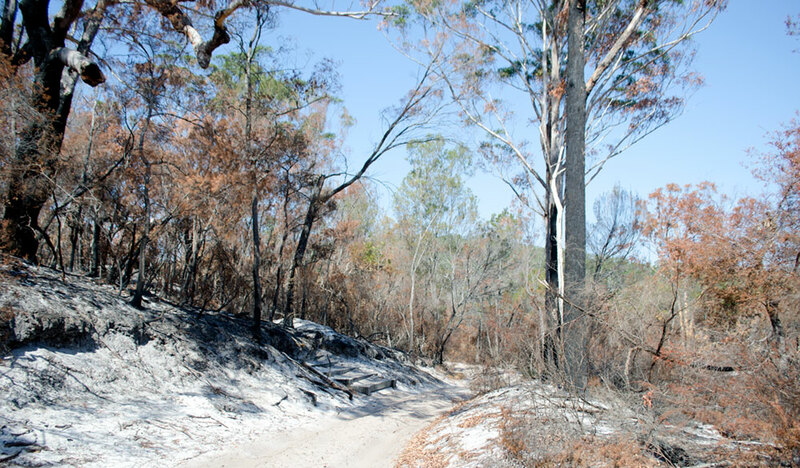 I had originally booked a three day self trek across Fraser Island but the persistent high winds and increasing temperatures meant the risk of bush fires was high and many trails across the island had been closed to walkers. I got the call to say the trip was off while chatting to a local fisherman. It had been years since he’d been to Fraser and if I was keen he was up for a couple of days on the island while he waited for his dry-docked trawler to be ready for her next voyage. There was an inherent wildness about Fraser as soon as we disembarked the ferry. A tannoy announcement reminded everyone on board to reduce the pressure in their tyres to cope with the island’s soft sandy tracks and that was it, we were off. No more, no less; Pretty much goodluck and get on with it. 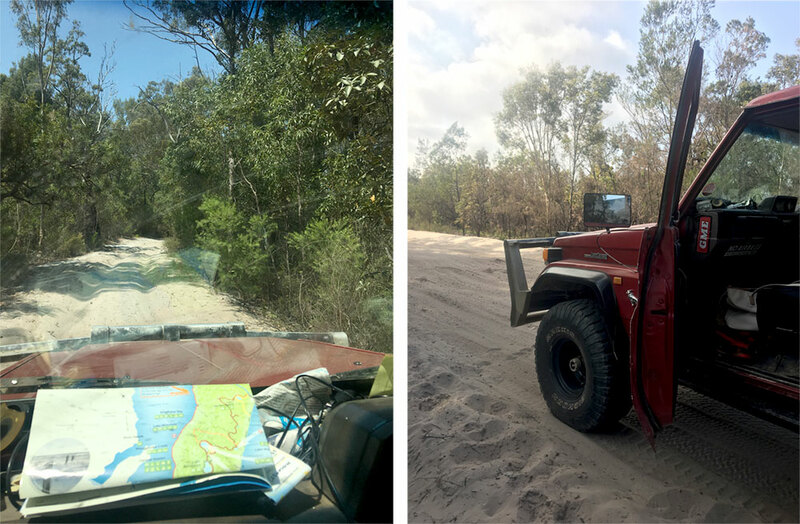 It was refreshing for once not to have to endure some boring health and safety spiel; Although perhaps we could have done with a brief pep talk as we experienced a sketchy moment when the 4wd came what felt like millilitres away from tipping on one sandy embankment. The split second when our ute teetered on two wheels before clattering back onto four felt like long minutes and it took a while for my heart to vacate my mouth and settle comfortably back into my chest. We headed to the island’s most well known lake early in the morning to avoid the half term crowds. We practically had Lake Mackenzie to ourselves and wallowed in the indescribably clear water for a while. The sand was so brilliantly white it was actually blinding to look at without sunglasses, in the same way a blanket of fresh snow is. We made a second visit to the lake on our last day but the beach was overrun by 4wd tag tours and half term day trippers so I’d definitely recommend an early start to experience the popular lake in all its magnificence without people around! We also walked through the dunes to Lake Wabby, where the sand rapidly drops off into a deep emerald void. Laying in the shallows with our feet dangling into the depths hoards of tiny fish appeared, eager to nibble on our waggling toes. So, no need to visit the 4* Kingfisher Bay Spa this time! Lake Birrabeen and Boomanjin were impressive sites whilst also much more tranquil in comparison to the mahem that Lake Mckenzie became by mid afternoon. We camped our one night at Central Station with a very make-do-and-mend tarp tied from a tree to the ute under which we slept in typically Aussie Swags. I’d love to return one day, perhaps steal a glance of the infamously pure Fraser Dingo and explore more of the island’s geologically fascinating lakes. But for now it was time to return to the mainland and continue north along the east coast.